On Saturday morning we went south from Cluj, through Turda and in approximate 45 minute we were at the gorges. Other friends came from Sibiu, which is about 2 hours more to the south. We stayed for the night at the Turda Gorges guesthouse (Cabana Cheile Turzii), just at the entrance to the gorges. It is a very good place to stay, because it’s just next to everything and it’s a nice building, looking like a manor house or a small castle. Soon after arriving there, we meet Gigi, from SkyFly adventure team, who was our guide in our first mountaineering experience. 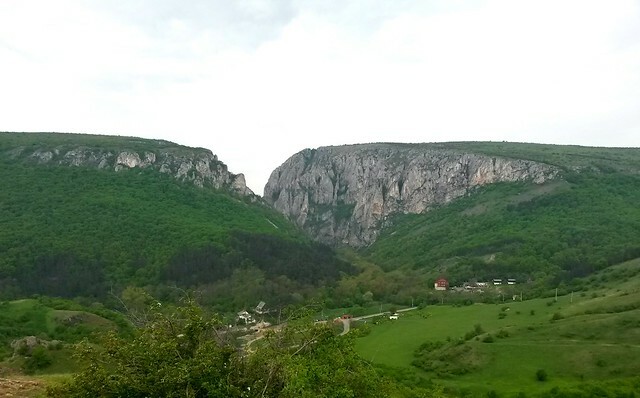 The Turda Gorges offers over 100 routes for climbing and escalation and is a popular place for mountain climbers. We, whatsoever, had almost no climbing experience, only what we occasionally did on our mountain treking trips, which was close to zero. For this first experience we choose to take the via ferrata route in Turda Gorges. The via ferrata was made in 2012 and since then it’s a subject of controversy between the experienced climbers who consider that “ordinary” people are not welcomed there and the guide to make these tours. The via ferrata was invented by the Italians on the First World War, to help their troops cross over the steep Dolomiti Mountains. Since then via-ferrata’s are popular touristic destinations everywhere they are build. The essence of a modern via ferrata is a steel cable which runs along the route and is periodically fixed to the rock. The technique of covering via ferratas involves using at least one safety lanyard at all times, thus limiting any fall. The cable can also be used as aid to climbing, and additional climbing aids, such as iron rungs (stemples), pegs orcarved steps. Necessary gear for climbing the via ferrata is lanyard (with energy absorber in case you fall 🙂 ), two carabiners, climbing harness, helmet. Gloves are useful too, since you will be climbing a lot of rock and you will use the steel cable a lot. As recommendations, it is better that every climber is alone on each cable sector (between two fixed points) and aware of falling rocks. The trail starts from the guesthouse and goes down to the Hăşdate river. You need to follow the path for about half an hour, until you cross the fourth bridge (you are on the left side of the gorges). Some friends from our group continued on the main path until the exit from the gorges and the plan was to meet them on top of the Sănduleşti hill. We walked away from the main path and took the unmarked path going up to a cave. Before reaching the cave there’s a second crossroad. The right one leads to a small plateau, at the basis of a steep wall, where there are several climbing routes and usually many climbers. Keeping the path and shortly we reached the first metal cable. It’s a short portion, more like a training route, but it gives you a taste of how the rest will be. Here is the entrance of the via ferrate route, going to the base of the slope and for a while the climbing is ease. Soon we have to climb a rocky ascending path and next is an almost vertical ascent which has some metal bridles for your feet in order to climb easier. We are suspended between two words. Above us it’s the Hili’s Cavern with its chimney, below us is the Hăşdate river. The ascent gets more and more vertical until we get to a cavern. Our climbing abilities get tested at the maximum since the rock wall has an over 80 degrees slope. It’s spectacular to look below and see your teammates climbing up. We are right under the cavern’s portal. Here we find a small balcony and we rest for a few minutes. We take some pictures, have some jokes and then back to the climbing. From here the route gets really sporty, until we climb over the cavern’s portal. Once past this vertical area, we reached a horizontal one from where you can see almost the entire via ferrata route. Above, there’s the impressive Hili’s Chimney where the route directs you. Covering this horizontal part is relatively easy because you are on rock, but those with fear of heights will feel very uncomfortable here. Even though I never experienced fear of heights, I have to say this was the most difficult part for me. After the horizontal path, again we are climbing vertically up through the chimney. Here the via ferrata ends. Here the view is again incredible, we are on top of a 300 meters cliff, with all the valley at our feet. Following a abrupt and rocky path, after a few minutes we reached the Cross of the Sănduleşti. From there we could see our friends wating for us on the other side on the hill. Following a V path down and then up, we reached our friends for a well deserved lunch break and some beers. To get to Turda Gorges guesthouse, we followed the red circle tourist marker descending Sandului Hill, through an oak forest. The retreat from via ferrata takes about 40 minutes, while the whole trip takes approximate 2-3 hours. The guesthouse has a big terrace were we had some more beers and in the end had dinner. Unfortunately the menu is not too rich and also the quality of the food is not the best, but after a full day in the open you can eat almost anything. The price of a double room at the Turda Gorge guesthouse is 120 lei. The price for the guided via ferrata tour was 80 lei/person, all equipment included.